1 How to make a swan made of paper? 2 How to make origami paper swan? 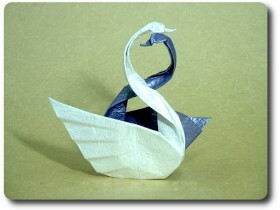 Before describing the process, how to make a swan made of paper, a little touch on a paper creation itself. Since childhood, we have already come across this, the so-called, art. We produce boats, which then set sail, some collect frog, airplanes, flowers. Also, paper can perform Swan. Just do not confuse with crane. This is not what. How to make a swan made of paper? Cygnus can do simple and complex. A simple embodiment is made from a square sheet of paper, which is folded so, to get two layers in the form of figures: diamond and triangle. From Triangle Business beak, and of a rhombus - wings and tail. It's very simple, It makes even a child. But we will consider the creation of another swan. Advanced embodiment is characterized in, that it is made from modules. Swan obtained voluminous and very beautiful. This is a complex and lengthy, for a single day works, Job. How to make origami paper swan? to understand, how to make a swan made of paper, We have to submit, how it should look assembled. Swan origami consists of several parts, are inserted into each other. Done it without glue. Should start with the paper selection. It should be tight. Suitable conventional paper printer. come into play. Cut the sheet into four strips along the perimeter. Then, each divided by 8 identical squares, cutting across. should get 32 parts. And all the modules will be 459. Respectively, sheets must be taken 15. Make a triangular pockets. Square folded twice in half. Fold the two sides into, corners hide, also wrapped inside. And so it 459 pcs. We collect swan. Give tri fray. Then one insert pocket of the other two central angle. See, they have the same direction. In this way, collecting ring 30 modules. Now we make a second ring, also from 30 parts. such rings, arranged one above the other, should have five. rings made. Gently eversible structure, holding the edge of the base. Next stage. Make a tail and wings. The wings are beginning to spread to the sides also, inserting triangles, each other. Only high subtracting the number. The tail is doing in the back of the base on the principle of the wings. To make it look convex, it is necessary to control the depth of insertion of the angles. Now, neck. This part of the bird should be long and filled up one side. Perform the same manner, each other closing the pouches prepared. That's all. All items used, swan ready. You can come up with - or support for poultry, eg, a circle, cut paper of a different color. 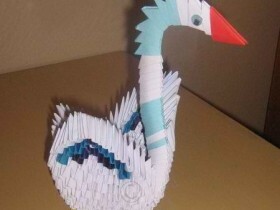 Yet there is another way of, how to make a swan made of paper, with the use of colored paper. Details are the same, as in the first embodiment, only distributed in color. Having made such a swan, It can be proud of the result.